"The calendar displays have helped immensely. There are two banks of monitors at San Bernardino Justice Center, one as you enter the building and another before the elevators. It does increase productivity because we don’t have to tape a paper calendar page by page. The electronic calendars are more efficient and professional looking." Located in San Bernardino County, the largest geographic county in the contiguous U.S. with over 20,000 square miles, the San Bernardino Justice Center encompasses a total of 383,000 square feet on a seven-acre site. Construction broke ground in 2011, and the completed building opened to the public in 2014. 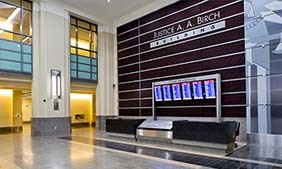 The Justice Center is made up of two elements: an 11-story courtroom tower that is visible for miles and a three-story podium that houses the entrance lobby and security screening as well as functions that the public accesses most frequently: clerk’s offices, jury assembly, and support spaces. The high-traffic courthouse, which accommodates over 65,000 visitors monthly, contains 35 courtrooms stacked into the 200-foot-tall tower, each level containing four courtrooms. The San Bernardino Justice Center was looking to manage facility traffic, improve staff efficiency and increase court productivity. Infax was chosen to provide its DocketCall® and Engage solutions to facilitate these needs. 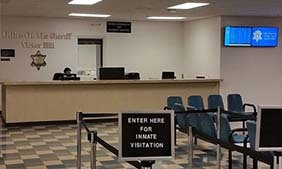 A total of 98 monitors were installed in the San Bernardino Justice Center, all of which run the Infax DocketCall® module. 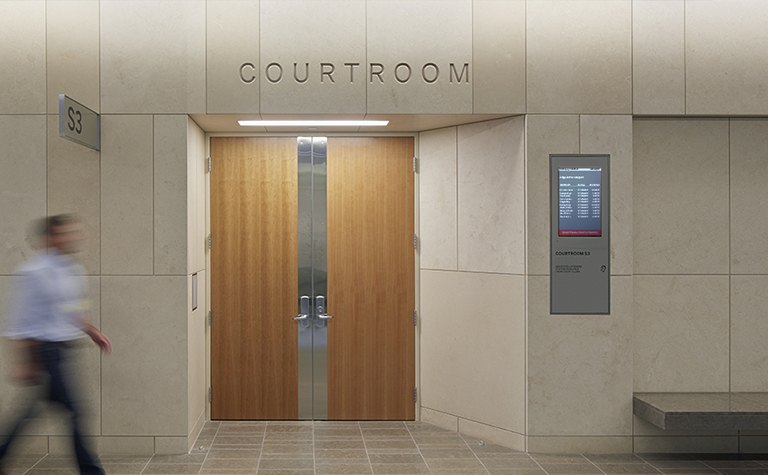 This module automatically displays up-to-date case information on commercial-grade monitors to all courthouse visitors. 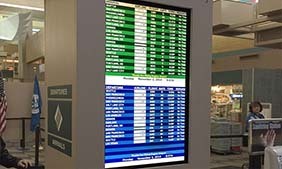 Twelve 55-inch monitors were installed in the lobby and split into two separate banks, each containing six monitors. Also located in the lobby is one 55-inch monitor at the security check point that displays general courthouse information using the Infax Engage module. On floors two through nine, there is one 24-inch monitor outside of each courtroom. 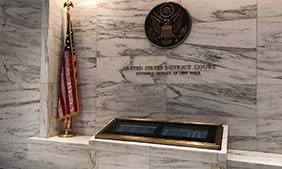 The three courtrooms on floor 10 also contain one 24-inch monitor which displays pertinent messages and daily docket information for each courtroom. With the assistance of the Infax Judicial Suite, the San Bernardino Justice Center is able to better manage facility traffc and improve courthouse productivity. The installation of DocketCall® in the Justice Center marks the ninth location in the county with an Infax system. 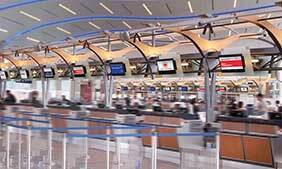 Visitors at all locations can effortlessly fnd where they need to go in less than 60 seconds.